The Blackstone Group was little known outside Wall Street until two events in 2007 catapulted it onto the public stage: the lavish sixtieth birthday party of its CEO Steve Schwarzman and the firm’s IPO a few months later. They advertised to the broader world what Wall Street had long known – that Blackstone had eclipsed better known private equity firms such as KKR and the Carlyle Group, both in size and profits. By then Blackstone owned all or part of fifty-one companies which together employed 500,000 people and raked in $171 million a year in revenue. A decade later, Blackstone has far outpaced its traditional rivals, diversifying more successfully and attracting far larger sums from investors, including pension funds and sovereign wealth funds. It ended 2017 managing $434 billion in assets, $51 billion of which was invested for the first time in 2017. 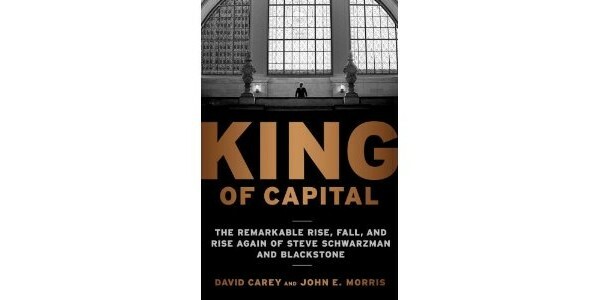 KING OF CAPITAL: The Remarkable Rise, Fall, and Rise Again of Steve Schwarzman and Blackstone (Crown Business; October 2010) tells how how Schwarzman and his co-founder Pete Peterson, starting with just one secretary in 1985, built a powerhouse that weathered the financial crisis successfully even as other institutions crumbled. The book recounts Blackstone’s evolution through fits and starts, disastrous early investments and internal clashes. It not only reveals the personalities behind the firm but also the larger forces at work in the corporate and financial worlds that transformed private equity from a handful of upstart investment boutiques in the 1970s and 1980s into a mainstay of the financial world, backed by billions from public pension funds and other institutional investors. Today, the book argues, Schwarzman and his counterparts represent a new breed of capitalist, a cross between the great bankers and corporate chieftains. Like banks, their firms provide capital, but unlike banks, they take control of their companies. Like sprawling global corporations, their businesses are diverse. But unlike corporations, their portfolios of businesses change year to year. Moreover, because they buy companies and sell them a few years later, they exert an outsized influence on the economy and the markets. This book challenges the conventional wisdom that private equity firms are “strippers and flippers” that loot companies of their best assets and leave them hobbled. Instead, it contends, private equity provides crucial capital and a unique, transitional form of ownership that in many case allows companies to undertake necessary changes. ■ How Blackstone formed the money manager BlackRock—which now manages $6.3 trillion in assets—and then lost it in a dispute over money. ■ The crisis Blackstone faced around 1990 after an exodus of seasoned partners left its upper ranks alarmingly thin. ■ How the egotistical Schwarzman proved nonetheless to be a shrewd entrepreneur, hired others with personalities as big as his own and recruited a star from the outside to assume the day-to-day reins at the firm. ■ The key investments that established Blackstone’s reputation and earned it billions in profits—and the misguided deals that cost it hundreds of millions. ■ How Blackstone and other private-equity firms have defied their image as gamblers and “barbarians at the gate” and proved to be much more prudent during the boom years than other financial institutions such as Citigroup, Lehman Brothers, and Merrill Lynch. And how Schwarzman’s innate cautiousness spared Blackstone some of the losses rivals suffered. ■ Transtar (U.S. Steel’s transportation subsidiary) and UCAR (Union Carbide’s carbon electrodes business) — early deals that helped the establish the firm as a credible buyout investor. ■ Edgcomb Steel, a metals fabricator that nearly defaulted on its first debt payment after Blackstone bought it — a deal that traumatized the young firm and cost one partner his job. ■ The disastrous investment in two German cable systems in 2000 that cost the firm $300 million in a year. ■ The German-American chemical maker Celanese — a 2003 investment on which Blackstone and other investors made five times their money, or $2.9 billion. ■ Equity Office Properties, where Blackstone found itself in a public bidding war and paid top dollar for real estate at the peak of the market in 2007 — and immediately sold two-thirds of it, just before the market turned. ■ Travelport, the parent of Orbitz.com, which had been cobbled together rapidly though mergers but had never been integrated. ■ Merlin Entertainments, a U.K.-based operator of amusements and theme parks, including Legoland and the London Eye, that Blackstone has built into a major international company. ■ Freescale Semiconductor, a huge, badly timed investment in 2006 that threatened to cost Blackstone hundreds of millions of dollars.